A face with closed eyes, wide open downturned mouth, and eyebrows. Upper teeth are showing. 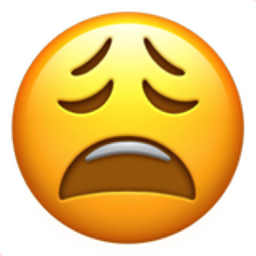 This is one tired emoji, most likely caused by lack of sleep or excessive exertion. Names & Annotations WEARY FACE Old name: ANGUISHED FACE Temporary Notes: Forms a pair with e-350.